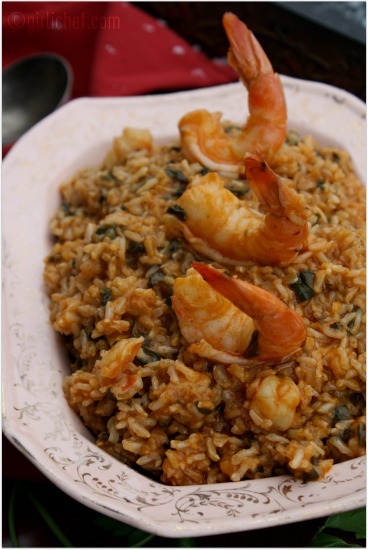 Do people eat risotto as a side dish? Because I pretty much always treat it as an entree. I don't know if that's a good thing or a bad thing, though. It's such a rich, creamy, comforting entity that a little goes a long way. But. Since I don't eat it all that often...yes, I've made it twice now in about a month's time, but that's rare...I reason that it's okay. Normally I stick with the traditional arborio rice in a risotto, but this one uses brown rice. 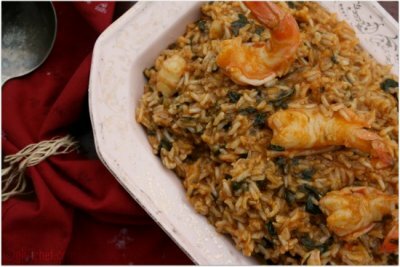 I used long grain brown rice because it's what I had in the pantry. And it takes about double the time of a normal risotto to make. That, my friends, is a loooooooong time. So gather up all of your "need-to-do's" and bring 'em in the kitchen with you. You'll be there a while. Next time I'll go with a short grain brown when making this. I'm thinking it could cook in a bit less time. But if you have the time, DO try this. The quick shrimp "stock" gives it fabulous flavor. The butter adds a beautiful richness. The shrimp makes it a looker. And the spinach adds nutrients and great flecks of color. 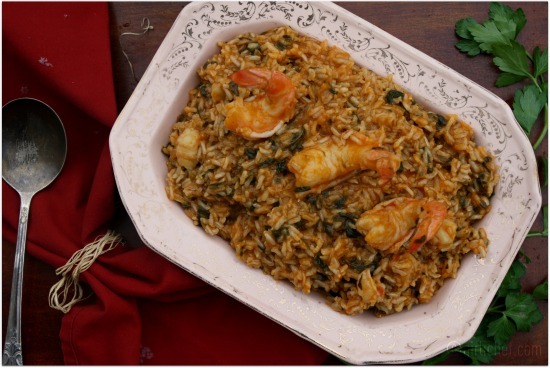 Brown rice adds something special to this rich, creamy risotto featuring spinach and giant shrimp. Peel and devein the shrimp, leaving tails on four of them (keep removed shells and tails). Butterfly the four shrimp with tails and coarsely chop the rest. Cover all and put in fridge until needed. Place reserved shrimp shells and half of the oil into a pan and cook on high for about a minute, stirring a few times, until the shells turn pink. Add garlic and when you can smell it, add the tomato sauce. Saute for a few minutes more. Add the hot water, parsley stalks, and lemon slices. Season with salt and pepper and bring to a boil. Reduce to a simmer and let cook about 20 minutes. Strain into a clean pan and keep warm over very low heat. Heat butter and remaining oil in a wide heavy-bottomed (~2" deep) skillet. Add shallots and saute for a few minutes over medium heat, until lightly golden and softened. Add rice. Stir for a few more minutes, until well coated and slightly golden in spots (it will smell amazing at this point). Add a ladleful of broth and stir with a wooden spoon until the liquid has absorbed. Reduce heat to low. Add another ladleful of broth and stir until it has been absorbed. Carry on this way for about 40-60 minutes (depends on your rice), until rice is almost tender. 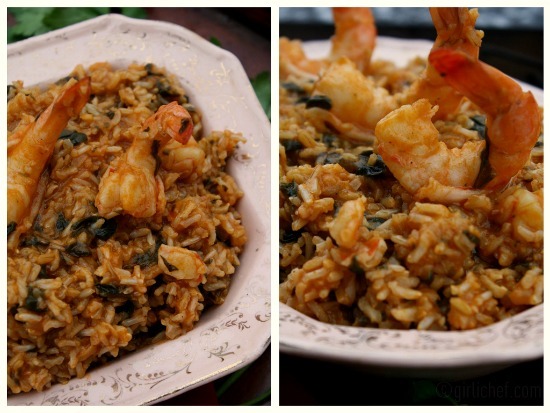 Stir in chopped shrimp and spinach. Continue cooking and adding broth (switch to hot water if you run out) for another 10 minutes, or until rice is tender, but still a bit firm inside (al dente). Stir in the butter and chopped parsley and set whole whrimp atop the rice. Cook for a few more minutes, until shrimp are pink. Remove from heat. Sprinkle a bit of salt over the shrimp, cover the dish and set aside for 10 minutes before serving.